NEW YORK, USA -- Ukraine's foreign minister said he expects his country to sign a cooperation agreement with the European Union later this year despite the EU's objections to the jailing of former Prime Minister Yulia Tymoshenko. 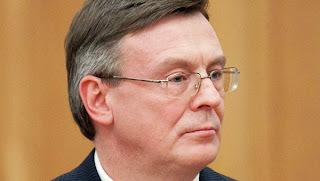 Leonid Kozhara said in an interview Tuesday with The Associated Press that the government accepts that the Tymoshenko case is a problem in relations between Ukraine and the EU. But he said a single criminal case shouldn't be an obstacle to Ukraine signing an association agreement with the EU. "We have hundreds of other matters to discuss with the European Union, and many EU member states support Ukraine in signature with the association agreement, regardless of the Tymoshenko case," he said. Kozhara said the government expects the European Commission, the EU's executive arm, to give a green light to an association agreement for Ukraine when it meets on May 15. The recommendation from the European Commission must then go to the European Council, which comprises the 27 EU heads of state and government, for a final decision. "Today the trend is very positive," Kozhara said. "I expect a positive decision." Nonetheless, the prosecution of Tymoshenko, the country's most vocal opposition leader, has strained the former Soviet republic's ties with the European Union and the United States. The West has condemned Tymoshenko's jailing and other legal cases against her as politically motivated and insisted on her release. Tymoshenko, a heroine of Ukraine's 2004 pro-democracy Orange Revolution, was sentenced to seven years in prison in October 2011 after being convicted of exceeding her powers as prime minister while negotiating a gas contract with Russia. On April 30, the European Court of Human Rights ruled that the jailing of Tymoshenko was a politically motivated violation of her rights, dealing a harsh blow to President Viktor Yanukovych, who has insisted that the case against his top opponent was not political. Kozhara gave no indication that the government was considering releasing Tymoshenko, noting that another criminal case initiated by the prosecutor is still pending against her. "We also think that deliberate illegal actions done by the former prime minister caused big economic damage to Ukraine ... not less than $6 billion annually," he said. Calling his country "a young democracy" that doesn't have a perfect record on human rights, Kozhara said, "We accept that Ukraine today is under criticism from the European Union and from our neighbors in the West." But he said Yanukovych has made greater progress in the last three years on democratic, legal, social and economic reforms than all previous governments. Kozhara said the association agreement that Ukraine expects to sign later this year has two parts, one a political statement on reforms the country must undertake and the other a comprehensive free trade agreement which the government considers especially important to promote foreign investment. In October 2011, Ukraine, Russia and six other former Soviet republics signed a free-trade agreement scrapping export and import duties on some goods. "By the end of the year," Kozhara said, "Ukraine may appear as the only country in the world to have two free trade agreements, in the West and the East." Kozhara met with American business leaders Tuesday morning before briefing the U.N. Security Council as chair of the Organization for Security and Cooperation in Europe which includes 57 nations in Europe, Central Asia and North America. He heads to Washington on Wednesday and will meet with members of Congress, the Ukrainian-American and American Jewish communities, more business leaders, and U.S. Secretary of State John Kerry on Friday. "Ukraine and the United States are strategic partners," Kozhara said, recalling that almost 20 years ago the country gave up its nuclear weapons. In talks with Kerry and business leaders, he said, he will also be talking about economic cooperation and diversifying energy sources. "We are going to sign two big production sharing agreements with the Exxon Mobil and Chevron companies to explore our shale gas deposits and the Black Sea shelf gas and oil deposits," Kozhara said. Ukraine is also extremely interested in liquefied natural gas technologies and the U.S. is the leader in that field, he said.